Shoes of Prey, one of our amazing customers, is speaking with us about the importance of a strong work culture and team work, and how a team lunch fits into that paradigm. We’re so thrilled to have Shoes of Prey’s Director of Operations and Founder, Michael Fox, answer a few questions about his company’s and employee’s values and culture – and of course, how food fits into that mix! The Shoes of Prey work culture is one to strive to attain – especially weekly team catch-ups over lunch! As a bit of background, Shoes of Prey specializes in creating one of a kind, create your own shoe designs. Shape, heel height, color, fabric…the sky’s the limit and the choices are wholly yours – ready to ship to you anywhere in the world in 6 weeks. Shoes of Prey has deliberately built a culture revolving around: amazing colleagues, recognizing great work, promotion and development, freedom and responsibility, embracing chaos, and work/life balance. 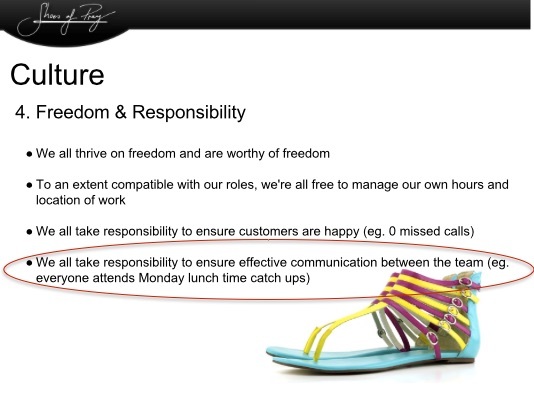 LK: How do you think the above work culture has worked for Shoes of Prey? Are those values still the same today? MF: Defining our culture like this a few years ago was a great move for the business and we’ve become stronger on all those points. The only one we’ve adjusted is we changed ‘work life balance’ to ‘work is life enhancing‘. LK: You provide team lunches for your staff every day – what part do you think that plays in reinforcing those cultural values? MF: Providing lunches particularly helps with the ‘work is life enhancing’ points. Team members don’t need to prep lunch at home or go out of the office to purchase lunch, so they can get their work done more quickly giving them more time at home. Eating with the rest of the team also helps build friendships in the office which helps enhance life too. You wrote previously about the benefits of a team lunch: creating a friendly culture, productive connections, higher productivity and employee retention. LK: If you were re-writing the aforementioned post today, based on what you’ve seen from running lunches over the last four years, would you still say that it has the same benefits? MF: I think it has exactly those same benefits and we’ve seen even more evidence of this over the last 4 years. We’ve had some really strong friendships form in the office and we just had our first engagement of two employees who met at Shoes of Prey! Sharing a meal together each day goes a long way to helping people form these strong connections, and these strong connections make for a fun working environment which makes people happier, helps retention and makes working together much more effective. LK: What advice would you give to other businesses that are thinking of offering a team lunch to their employees as a company perk? MF: For me the benefits far outweigh the costs, I’d highly recommend doing it. MF: While it’s hard to measure and put a number against, I’ve absolutely no doubt the ROI on providing team lunches makes it well worthwhile. We’ll continue to do it. MF: The salmon or slow roasted lamb from Chris, the head chef from Orto. Amazing!